Nishan is a word with Arabic roots. In Sikhism, Nishan means flag, insignia, or banner. Sahib is a term of respect meaning Master, or Lord. In Sikhism, the flag is addressed as Nishan Sahib to show respect for the exalted insignia. The Nishan Sahib is raised and flown at every Sikh gurdwara at a prominent spot at the high point of the property when possible. The Nishan Sahib is flown from a flag pole and may also be affixed to the top of a high building on the gurdwara grounds. The Nishan Sahib is carried at the head of parades usually by five Sikh men, or women, representing the Panj Pyare, or five beloved administers of Amrit nectar given during the Sikh initiation ceremony. The Nishan Sahib flag may be of any size, is triangular in shape and has two basic colors which range from yellow to deep orange, and royal blue to grayish blue. The Nishan Sahib is embellished with a khanda the insignia representing the Sikh coat of arms and originally had a blue background with an orange khanda. The color scheme is often reversed in modern times. The most popular color combination for the modern day Nishan Sahib is for the khanda or Sikh coat of arms to be a deep blue appliqued onto a bright orange background. The Nishan Sahib flies all year round, and taken down ceremoniously and changed annually. The pole may be bathed with milk to clean and prevent rust. The flag pole is often times wrapped or covered by cloth of the same color as the flag background. Atop the flag pole is either the representation of a khanda double edged sword, or teer, the broad tip or head of a spear. The Nishan Sahib dates back to 1606, when Sixth Guru Har Govind raised the first Sikh flag over the Akal Takhat seat of authority in Amritsar, India. At that time, Sikhs called the flag Akal Dhuja (undying banner), or Satguru Nishan (true guru's insignia). In 1771, Jhanda Singh raised a second flag at the top of Gurdwara Harmandir Sahib of the golden temple complex in Amritsar, where two illustrious Nishan Sahibs still fly proudly. 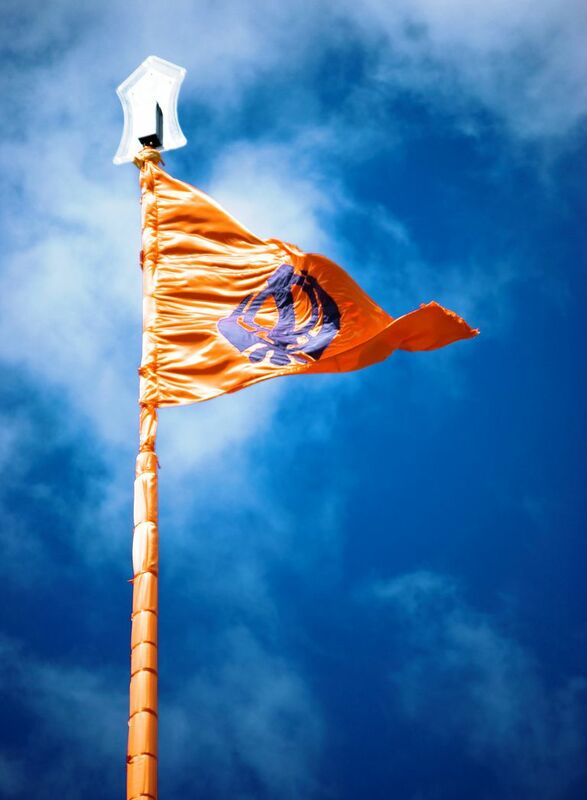 Over the centuries, Nishan Sahib flag poles have been fashioned from tree trunks, wooden posts, as well as bamboo, copper, and steel, or iron poles. Pronunciation: The phonetic pronunciation can be either nishaan, or neeshaann. The first syllable of Nishan, depending on the Gurmukhi vowels used in spelling, may be pronounced as nishaan with the short i sihari sounds like i in fin, or neeshaan with the long ee bihari to sound like knee. Second syllable aa kanaa is a long sound similar to the a in shawn. Alternate Spellings: Nisan, Nishan, Nisaan, Neeshaan, Neesaann, Neeshaann. Common Misspellings: There is no standard spelling of Nishan Sahib. Other phonetic spellings are acceptable and interchangeable. Also Known As: Akal Dhuja, Satguru Nishan, and Jhandaa are synonymous terms for the Nishan Sahib Sikh flag. Do Sikhs Believe in a Bible?